I like this poem by Raymond Carver very much. It’s lucid and realistic, a bit like a Robert Frost poem. And it’s apparent simplicity hides the fact it is well made and slightly mysterious. opening than ‘ It’s so early’ (and if he had chosen this the two ‘s’ sounds would be overly sibilant for a start ) and takes the reader straight to the time of day and the changing light in the most direct way possible. I like the way ‘it’s still almost dark out’ rather than the more obvious ‘almost light’. The reader is then are introduced in similarly brief fashion to the ‘I’ voice of the poem – ‘near the window with coffee / and the usual early morning stuff that passes for thought’ . This establishes a downbeat, self-effacing and perhaps almost weary, ‘nothing much doing’ tone. Then the boys appear in the poem, and with them the sky is ‘taking on light’- an elegant way to describe the coming of daybreak. The day is beginning gently and quietly and slowly, since the ‘moon still hangs pale over the water’. This image, (and notice how the line hangs further out into the white space than any of the other lines) arises easily but surprisingly from the poem, and in a such a way that it does not demand to be the central focus of the poem . Here is Carver, responding to an interview question about the images in his poems. that necessitates an early start, but this detail doesn’t really matter. They almost mirror one another in appearance, and are in a moment when life is, hopefully and for the majority of children, simple- the sort of moment when companionship or friendship is enough to bring the happiness of the title, before ambition, before any of the challenges or the ‘falling apart’ to come. They are, for this moment, between day and night, between childhood and adulthood. It is ambiguous as to whether the boys are restricted from making such a gesture by social convention, their own inhibition, or maybe a lack of awareness that their happiness might be expressed physically. of the poet/viewer’s conversational opening tone and the transcendent ending, maybe. The truth of the observed relationship in Carver’s ‘Happiness’ resonates with me. I remember moments in a boyhood friendship such as this; the feeling of being happy in that moment together, away from everyone else and alone with one best friend. Carver suggest that at least ‘for that minute / death and ambition, even love, /doesn’t enter into this’. The paring of ‘even’ and ‘love’ intrigues me, since it would be easy to surmise that the poem is, in fact, about love. But ‘even love’ suggests that happiness is more simple, or perhaps more complex than love. When I started writing this piece, (on a whim, this afternoon, instead of doing some work I have to do) I thought the poem might step off, perhaps, more lightly, more hopefully, and leave the boys there, without the following concluding statement. But as I write I’m beginning to feel that Carver got it right. As it stands, the last two lines bring back an awareness of the narrator’s presence and what seems his almost proprietorial duty to close the poem. The final line brings the observing narrator back, reminding the reader of both the writer’s and his or her place on the periphery of the passing scene. It is as though the boys in their happiness have allowed Carver, and us, a moment of escape, and now he, and we, must return to our grown up realities. Carver performs the task of wrapping things up, and in doing so pulls us away from this vision of an uncomplicated moment. With the final lines ‘and goes beyond, really/ any early morning talk about it’ , Carver returns to that downbeat, self-effacing tone that opened the piece. He is inferring that his poem, this small work of art -is itself ‘early morning talk’. The word ‘talk’ suggests a kind of intimate but casual relationship has taken place between writer and reader, and this contrasts with the encapsulated joy of the description and beauty of the image. It may be that Caver is suggesting that the poem we have read is nothing much in comparison to the experience it depicts. It may be that in contrasting the tone between the ‘matter of fact’ voice – the one that opens and closes the poem – and the flight into description of ‘ such beauty’ before the paradoxically downbeat conclusion- the poem is demonstrating exactly what it describes, namely that happiness, and even the observation of happiness, is fleeting. A bleaker conclusion might be that happiness is a condition experienced in youth, before other concerns can enter. But that’s one interpretation, and the fact happiness ‘comes on/ unexpected -and what a simple and effective line break that is- could be read as containing the hope that it can and will arrive again. 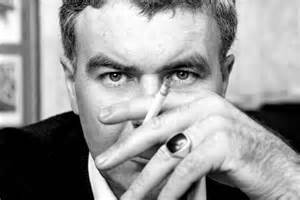 You can read more about Raymond Carver and find some more of his poems at Poetry Magazine. Previous A conversation with Michael Brown, poet.